I experienced the same interference sounds while moving the mouse. Try muting the CD-connection in the system audio-mixer. while the main ground-connection already is there via the bus of the soundcard. A ground-loop. i dont remember if i even had the cd audio cable connected... (i never listen to cds on the comp, just rip them). anyway, that vid card is long gone and i have a much better one now. good to know if i ever have issues again, thanks. Yay for bumping old threads! How about some more desktop screenshots, people? That's my desktop just a while ago. I'm not entirelly sure if this'll work, but if so, this was my previous desktop. So you're a teetotaller, eh, älskling? Just a blue background with two buttons. The Bin-icon is just there to quickly wipe buttons left on the desktop after a setup. My real desktop is the custom build bar of TC to start with. A digital terrain made by my daughter Ellis. Avant Browser is the old brower I used when I made that screenshot. Its one of those IE shell browsers. Using the IE core to display the page, but the rest is by Avant browser. This makes it more secure and faster, and adds lots of options. Nowadays, I use Opera though. xoblite as shell, qttabbar in explorer, XP is os. Nuff said. nothing changed here. 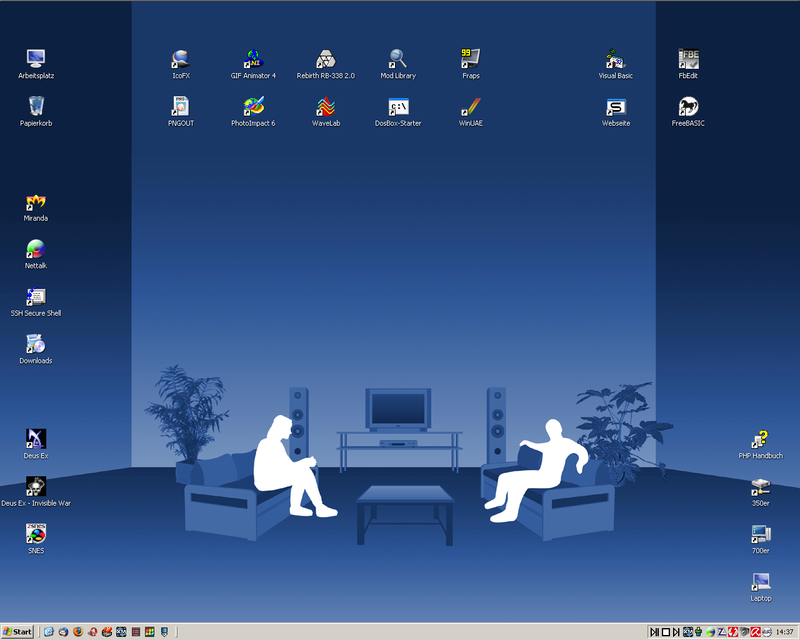 i could show you my ubuntu desktop, but that's just plain blue. lol -- you wouldn't believe the angst that caused when we decided to try migrating an existing Windows installation to VirtualBox. :/ For everyone else's reference, if you do it, it's pretty much a one way trip, even if you keep Windows on a separate partition. The Windows installation you see on my desktop, though, is a nice clean install, so that we can have a 'clean room' testbed for stuff.